Setting up an office before officially opening your business is an important step that many entrepreneurs choose to do. While waiting for the proper business licenses, visa documents, and company registration documents to be processed, you need a physically address in Japan where you can work from. Individual owners may desire to run things from their apartment initially, but one problem with that the investment/manager visa requires the registered home office to be different than the person’s residence. Making changes to a company’s registration documents can be expensive, so it’s cheaper to not have to do so. Also, running a business from residence is usually forbidden by rental agreements. There are many other advantages to opening an office right away such as having a place to meet with potential future clients or employees. 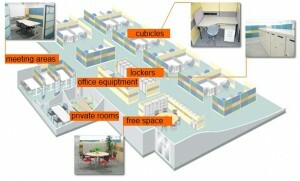 There are several great options out there for temporary office space. One of the best is the free office space offered by JETRO IBSC. The space is available for use up to 50 days and rent free (extensions are possible as well). Because the space is only available for foreign business companies, you can easily start networking with nearby tenants. Space is limited, but there are usually at least a couple vacancies open. For details on how to apply, see the office JETRO home page or contact Zxent Pro for assistance. Also another free option is the IBPC offered space in Osaka Minato. The offices can be used for 6 months free. Although the area is a little far from downtown, the facilities are very nice (and a nice view). For some business, the free office space might be too far from where they want to start their business, such as in downtown Umeda or Namba. 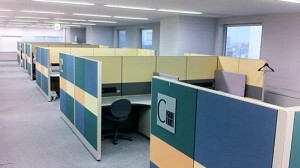 Another option is to rent temporary office space. There are lots of options available, but one that stands out Risshian in Honmanchi. As we introduced in our introduction to Osaka locations page, Honmachi is in the heart of Osaka and a popular office building location. The Risshian building has floor space specifically for new businesses. The monthly rent is only 13,650 yen a month (about $175 USD) with a 39,000 yen (about $500 USD) refundable deposit. The shared office space can be used 24 hours a day and has office equipment such as copy machines and fax machines available for use. Also, there are meeting rooms that can be used to receive guests or have staff meetings. Unfortunately, Risshian’s website makes no mention of English support, so moving in might be difficult without help. Zxent Pro can help you with this and other procedures you may need for starting your business. We can help you get a strong head start so that you can open your business as soon as possible and start generating revenue. We also offer many post-opening services as well.